At least 17 Colombian troops have died in an ambush in the east of the country, close to Venezuela's border. It is not clear yet whether the soldiers were attacked by rebels belonging to the FARC or the ELN, both of which are active in the region. 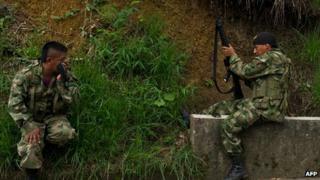 Clashes in the south also killed four troops and several Revolutionary Armed Forces of Colombia (Farc) fighters. Bogota and the Farc are currently holding peace talks in Cuba aimed at ending five decades of conflict. The talks in Havana, which started in November, represent the fourth attempt at a negotiated peace deal since the beginning of the conflict in the early 1960s. Saturday's ambush happened in a rural part of Arauca known as El Mordisco. A number of guerrilla fighters were injured and captured, reports said. Earlier the Farc said it had captured a former US soldier and was willing to release him to prove its commitment to the peace process. In a statement, the rebels named the man as Kevin Scott Sutay and said he had been taken on 20 June in El Retorno in the southern Guaviare Department. The US has denied he was on any form of military operation, saying he was in the area as a tourist and had "nothing to do with Colombia's internal conflict". The Farc are thought to have some 8,000 fighters, down from about 16,000 in 2001. Hundreds of thousands of people have been killed since the conflict began with some three million more internally displaced by the fighting. On Monday, the Farc's chief peace negotiator said the conflict was nearing its end. Ivan Marquez, who is taking part in the talks in Cuba, called on left-wing parties and unions to join the effort to achieve peace. The government wants to sign a peace accord by November. But Mr Marquez warned against rushing into a settlement. What is at stake in the Colombian peace process?